We live in a democratic society where we share responsibility for our asylum policy. But how can we be sure it is the right policy if it is too complex for most people to comprehend? The Asylum Machine investigates the complex world of asylum policy. How does it work? And how do we want it to work? This is a good example of a project that completely got out of control and entirely became something else than what is was once meant to be. Theologist/philosopher Huub Oosterhuis asked Els van Driel and Eefje to write a 'black book' about the Dutch asylum policy. But no one would buy a book like that, they thought. Often the stories are jet black, but most solutions are way more complicated. And a book is soon outdated by policies that sometimes change by the day. Moreover, Eefje and Els thought people should not only take note of the policies, but should also be able to talk about it. Eventually it became a mega, interactive project: a series of pubic brainstorms, exhibitions, a website, a web documentary, a television documentary and a two-part radio documentary. 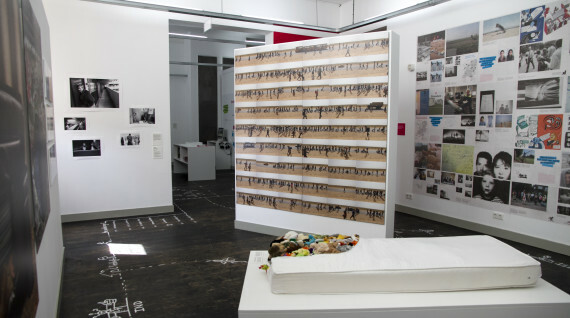 The Asylum Machine combines journalism, documentary film, photography, design, art and debate. The Asylum Machine wants everyone – refugees, citizens, policy makers and policycriticasters – to think along about our asylum policy. Together, we look for solutions to the bottlenecks: small and large. We received many ideas. What we did with The Asylum Machine was as much an effort to have the audience look further than their own, strong opinions, as well as an effort to come up with real solutions. But is that still journalism? Or have we become activists? A former editor in chief of Dutch newspaper De Telegraaf criticised The Asylum Machine for this ‘constructive journalism’ and even called journalists who try to make the world a better place dangerous. Can you be objective and at the same time try to activate your audience to look for solutions? Those are questions we struggle with often. But calling journalists who look further than todays issues in the media is not only absurd, it is also damaging for innovative forms of storytelling. We believe that it is necessary to think about our role as storytellers continuously, and to reinvent the way we use media. Not only because it is a lot of fun, but also because we have a social responsibility. Especially in this time of polarisation. We rather contribute to constructive journalism than to deconstructive journalism. The web documentaries take viewers into the – often unknown – world of asylum. We do this using film, photography, short informative texts and interviews to shed light on (various aspects of) asylum policy. Viewers are also asked: what do you think? And do you have a great idea yourself? Besides original footage, the web documentaries feature a treasure trove of archive material, photo series, fragments from relevant documentaries and fiction films, newspaper articles and news reports. In combination with short texts, notes, observations and questions, this complex and extensive topic is presented in ‘bite-sized’ chunks and organised by chapter. Viewers can navigate through the different ‘phases’ an asylum seeker goes through, roughly from Arrival and Procedure to Residence or Rejection and Departure. Via ‘people’ viewers can also follow the personal story of an asylum seeker. Through these personal stories the viewer gains insight into the various ‘routes’ an asylum seeker can follow in our asylum procedure. On the website you find everything about the project The Asylum Machine, such as the calendar, the ABC of the IND and background information on the different (asylum) organizations. On the idea page, you can send in your idea for a different policy and respond to the idea of others. 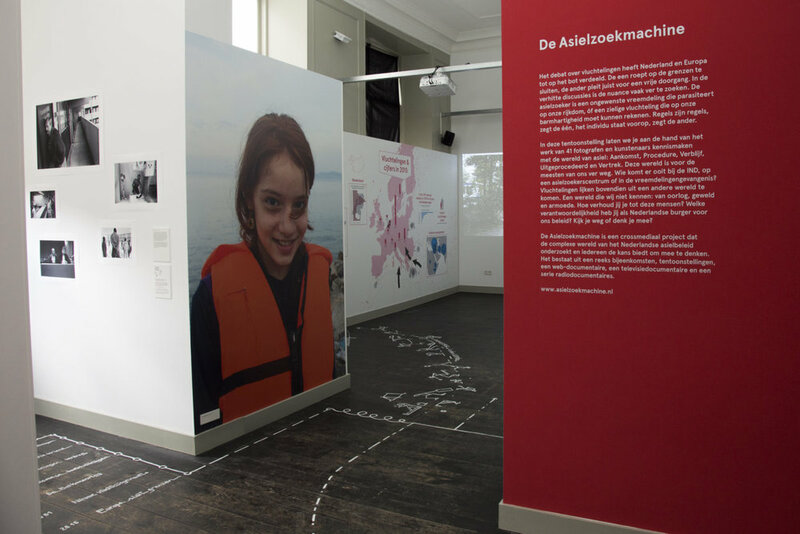 In the exhibitions we invoke empathy for the world of asylum through photography, visual arts and video-installations. The do-it-yourself (DIY) exhibition comprises a newspaper that can be hung up as an exhibition, in libraries, cultural centres, offices, football canteens, mosques and so on. Combining photography, text and info graphics, it depicts the different stages that a refugee goes through, from the journey to arrival, the asylum procedure to residence or departure or, in many cases, somewhere in between. Using the design and editorial format of the Dutch version, a European or other coutry-specific newspaper can be produced. At Humanity House (The Hague) and Melkweg Expo (Amsterdam) we also added other works: prints, threedimensional work and video installations. Three artists were commissioned to create new work. These works goes beyond the cliché image we have of ‘the asylum seeker’ and challenges the visitor to relate to the subject. At Humanity House with work by: Chris de Bode | Joost van den Broek | Ad van Denderen | Alessandro Falco | Robert Glas | Karijn Kakebeeke | Roel Mathijssen, Jason Terlouw, Tessa Mathijssen, Ricardo Buijs, Apollonia Duijster & Malou Rutten | Nafiss Nia | Uljana Orlova | Frank Penders | Marieke van der Velden & Philip Brink | Dirk-Jan Visser | Michiel Voet | Munir de Vries. The Asylum Machine was on show at Humanity House, The Hague, from 01.04.16 until 07.01.17. On the right you see the Do-It-Yourself exhibition, here at Humanity House, The Hague. Humanity House created an educational programme with the exhibition. Pupils are challenged to think about the accommodation and treatment of asylum seekers in The Netherlands. How does it feel to not know where your home will be? How would you like to be accommodated in case you had to flee? In groups, the children come up with a recommendation for the Dutch asylum policy and they will get the chance to make that recommendation part of all the ideas and solutions that are collected by The Asylum Machine. In the spring of 2016, we held 11 meetings around the Netherlands. Each meeting had a different theme: Procedure, Integration, Departure, Rejection, Children’s rights, etc. Together with refugees, residents, policy makers and critics, we brainstormed solutions to the bottlenecks within these themes. A citizen’s jury was asked to attend and report on all the meetings. More than 100 ideas were gathered and presented to stakeholders and politicians. The format we developed, aimed at generating new ideas, can be used to organise brainstorms in other countries. How should we deal with the refugeecrisis in The Netherlands and in Europe? The struggle with moral dillemmas raised by the international refugee question and the search for possible solutions are central in an essayistic documentary. Broadcast by IKON/EO on 20 June 2016. As part of The Asylum Machine, radio maker Laura Stek made a documentary-diptych about the history of the asylum policy, for the Dutch VPRO radio programme OVT. With amongst others former ministers of Asylum Hilbrand Nawijn, Job Cohen, Aad Kosto and Rita Verdonk. Brainstorms: De Nieuwe Liefde (Amsterdam), Humanity House, Nutshuis (The Hague), Hogeschool Windesheim (Zwolle), LUX (Nijmegen), Debatcentrum Sphinx (Maastricht), Arminius (Rotterdam), Culturele Zondagen (Utrecht). Many thanks to Eyes on Media, Fotolab Kiekie, Theater aan het Spui. This project was created in collaboration with many persons and organisations amongst who: Ministerie van Veiligheid en Justitie, COA, IND, DT&V, VluchtelingenWerk Nederland, Kerk in Actie, Amnesty International Nederland en Defence for Children. Financially supported by: Mediafund, Mondriaan Fund, Netherlands Film Fund, Creative Industries Fund NL, De Nieuwe Liefde, The Art of Impact, Fonds21, NPO, BankGiroLoterij Fonds, BNG, Democracy and Media Foundation, Municipality The Hague, Fonds 1818, Protestantse Kerk, Kerk in actie, Casterenshoeve, Municipality Maastricht.